You’re never too old to let your hair down once in a while. It’s true that as we get older and wiser the fear factor can take hold, as it did for me when I stood at the top of a very high mountain in the French Alps last year. Nevertheless, many of us still love the chance to unleash our inner child. 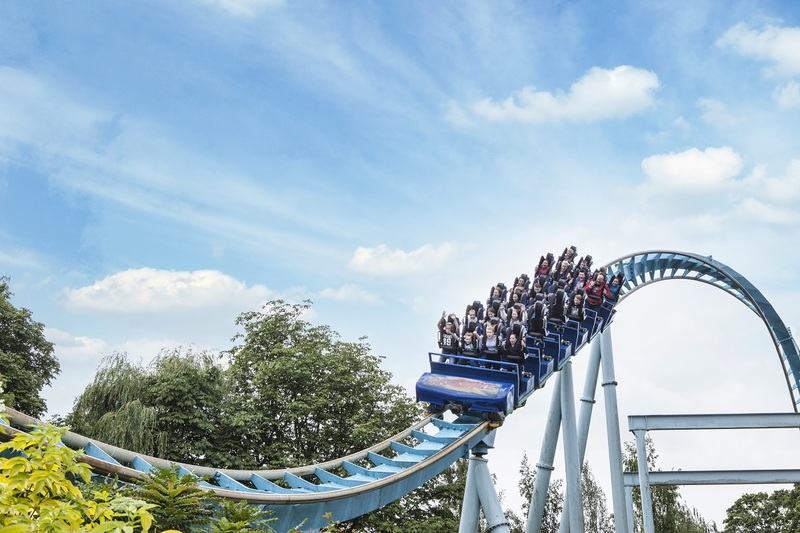 So if you want to celebrate the start (or end) of your holiday with lots of fun and laughter, hotfoot it to award-winning Drayton Manor, located in Tamworth, Staffordshire. Just over two hours drive from Liverpool Cruise Terminal and with over 25 rides for all ages, plus a zoo, it’s a great day out for all the family. And if you have a night to spare, you can even stay at the on site four star hotel. When my partner and I, plus 11 year old Oliver visited, there was a food fair selling cuisine and street food from all corners of the globe, as part of the ‘Summer Sensation’ event. Lunch sorted! Spotting a green coaster right in front of us, we decided this would be our first ride. We then queued for around 30 minutes to get on, not too bad for a Saturday in August. But oh was it worth it; the Accelerator raised our BPM’s nicely, in preparation for the more extreme rides to come. What followed was a couple of hours of adrenalin fuelled fun – I admit I did not go on all of them – but Oliver was more than happy to test his nerves, in fact we couldn’t get him off Pandemonium. a stomach flipping gondola swing ride. My personal favourite was G Force, the only X-Car coaster in the UK which reaches a speed of 43.5 mph and features three inversions in a rare roller coaster element: a Bent Cuban Eight – yes, you’re fully upside down for much of it. After an al fresco lunch we decided to slow the pace with a visit to the zoo. Conservation is important to the 15-acre zoo as they realise that they have a legal and ethical responsibility to conserve species. Captive breeding programmes help maintain genetically healthy populations of animals, with the aim of keeping a self-sustaining population so that zoos do not have to go to the wild to collect animals for exhibit. As well as drawing visitors’ attention to issues such as global warming and invasive species, their education team runs clubs and sessions on subjects including conservation. It’s good to know that a small proportion of every entrance ticket contributes to conservation work carried out by the zoo’s conservation partners, including the Red Panda Network and Asian Turtle Programme. If you look around the grounds, you may also see nest boxes, bat boxes, insect hotels and other examples of how they try to encourage wildlife. There are dozens of animals from across the globe – as well as the slender-tailed meerkats which we could have watched for hours, I was especially excited to see the Sumatran tigers. And unfortunately it wasn’t our day to see the tigers, which were obviously feeling shy, but our zoo antics combined with the thrills of the theme park, had ensured a thoroughly entertaining summer day out. For more information on Drayton Manor, Drayton Manor Hotel and upcoming events, visit www.draytonmanor.co.uk.